Later production were equipped with a 3"/50 AA gun. This was often further replaced with a 40mm Bofors AA gun. The machine guns were often upgraded to 20mm Oerlikon antiaircraft guns and some units were equipped with Mousetrap. Eight were rearmed as gunboats (PGM-1 through PGM-8) and another 70 became control boats. The SC-492 class were wooden-hulled submarine chasers based on the earlier SC-453 class. They handled well but were unstable and cramped, making them all but useless except as coastal craft. Because production of the diesel engine model for which these boats were designed fell behind schedule, other models of diesel engine were substituted in about half the boats, so that actual speed varied from 15.6 knots to 21 knots. This meant they had little chance of keeping up with a surfaced U-boat. 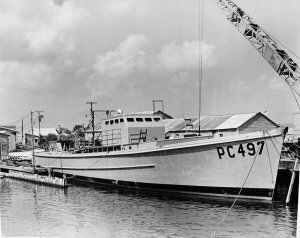 A number were converted to other uses, including PGMs (Motor Gunboats) which saw some service as river gunboats in the Philippines. 435 vessels were completed and another 37 ordered but canceled. They cost about $500,000 apiece. Of the units completed, eight were given to Brazil, 50 to France, three to Norway, and 78 to Russia as Lend-Lease. All were retired at the end of the war except for a few units retained as coastal minecraft.